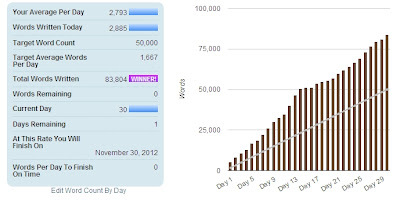 If you remember, back in November Younger Daughter and I undertook the NaNoWriMo challenge. NaNoWriMo stands for National Novel Writing Month, and the idea is to write a 50,000 word novel in one month, which comes out to 1667 words per day. Younger Daughter easily did this, and in fact wrote a 84,000 word book that month. 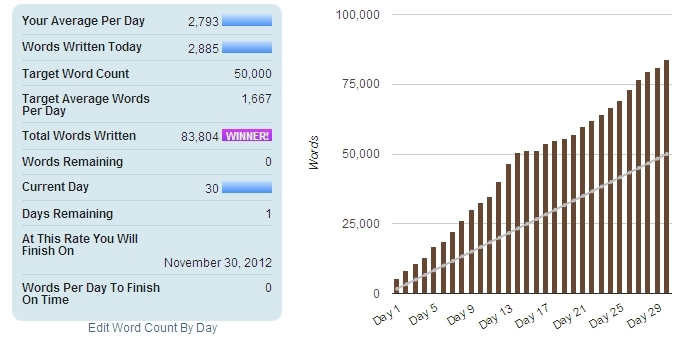 This month NaNoWriMo was putting on a "challenge" in which writers can set their own word count goals. Younger Daughter signed up with the idea of writing 100,000 words in one month. Yes, one month. That's 3333 words per day. When April 1 arrived, she plunged into the challenge with enthusiasm. Although I didn't officially sign up, I did some novel writing too, adding some to the novel I worked on last November, but with only a casual word count of about 20,000 spread throughout the entire month. But Younger Daughter, to her credit and despite a chaotic month with many interruptions, kept her word tally up. When I took these photos, we were in a small town getting some work done on our car tires. With several hours to kill, she and I holed up in a cafe and wrote. Everywhere she went, she toted her AlphaSmart along and wrote wrote wrote. And this morning -- the last day of the April NaNoWriMo challenge -- she came into the kitchen and announced, "I'm done!" Her story is finished at 90,000 words. She intends to spend today fleshing it out a bit to achieve her round 100,000 mark. But personally I don't give a rip if she "wins" this challenge or not. She's already won. She set out to write an impressively lengthy book in a month, and she did it! I excused her from schoolwork for the duration of April, figuring that this writing project was "school" enough. I don't know many 14 year olds who could do what she did -- much less adults. Younger Daughter says she wants to write professionally when she's older (gee, I have no idea where she got that ambition), but even if she never achieves that goal, I'm proud as can be that she had the dedication and maturity and plain ol' stick-to-it-iveness to pound the keyboard for so many hours per day. I've always told my girls that if I could launch them in adulthood able to write like educated young women instead of texting monkeys, then our homeschooling efforts will not have been in vain. I'm pleased to report success in this endeavor. Very impressive to have a young lady setting goals, reaching them & going beyond. Kudos Lewis clan! Wow. Wow! And WOWWWWWWIE!!! That is so exciting to hear! I think it's amazing what a child can do when not subjected to the standard behavior expectations in this nation. I pray my young ones will be this diligent and passionate in their academic endeavors. Nice job Younger Daughter! And, really, Patrice you deserve a pat on the back for fostering and feeding her gifts. Well done! Well done! Congratulations younger daughter! And you too, Patrice, for your efforts in raising a couple of responsible, decent young ladies. My son, who is now working on his M.Div. at seminary (he's only 20) wrote a few full length works of fiction before he turned 18. I thank God He made it possible for me to homeschool my kids. I told you homeschooling would never work!! Hey, why don't you sell your story. I personally really like to read local authors and also enjoy "life" stories. Maybe you could do a download, like your mom's canning books. When I was way young, I wanted to be an author and wrote, wrote, wrote. That is how one improves, so please keep it up and know that many of us would love to read your work. I agree! I'd love to see a novel written by such a young author! Incredible. I doubt I SPEAK 3300 words a day, let alone type them.